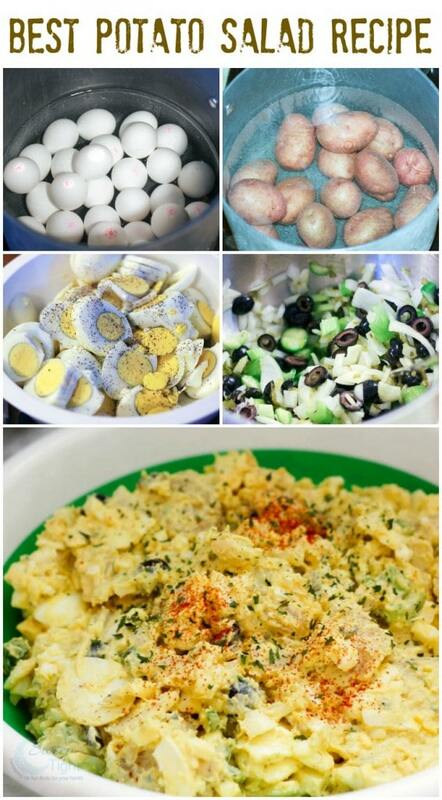 My mother-in-law makes the best potato salad recipe. As promised, I am sharing it with you with her permission. I think she calls it “American Potato Salad”, but Mike said the only acceptable name was the “Best Potato Salad”. In any case, it’s a sure crowd pleaser. This post contains affiliate links, but all opinions are my own. The recipe she gave me is enough to feed a large gathering. This was my first time making it on my own, so I wasn’t sure what to expect. I don’t want to alter her ingredients or instructions in any way, but keep in mind if you make it – it’s large. It filled my large Pampered Chef collapsible bowl to the top. Boil potatoes until they are tender to poke with a fork. Peel, and cut into bite sizes. Place into a bowl and salt and pepper them. Hard boil eggs, remove shells and cut into medium pieces. Add to potatoes and salt and pepper them. Finely chop the onion and roughly chop the celery and cucumber. Drain olives from can and cut them in half. Add all of this plus the sweet pickle relish in a separate bowl. Season generously with paprika, Mrs. Dash, and parsley flakes. Add relish mixture to the potatoes and eggs. Mix all ingredients together in a large bowl. Add enough mayo to reach a creamy texture. Transfer to a serving bowl. Sprinkle paprika and parsley over top. Refrigerate until ready to serve. Tastes best the same day as you prepare. Next Try: Pea Salad Recipe – Easy BBQ Side Dish! My 3lb bag of potatoes contained 17 potatoes. That meant I needed 35 eggs! Definitely feel free to adjust this recipe down unless you are feeding a large bunch. 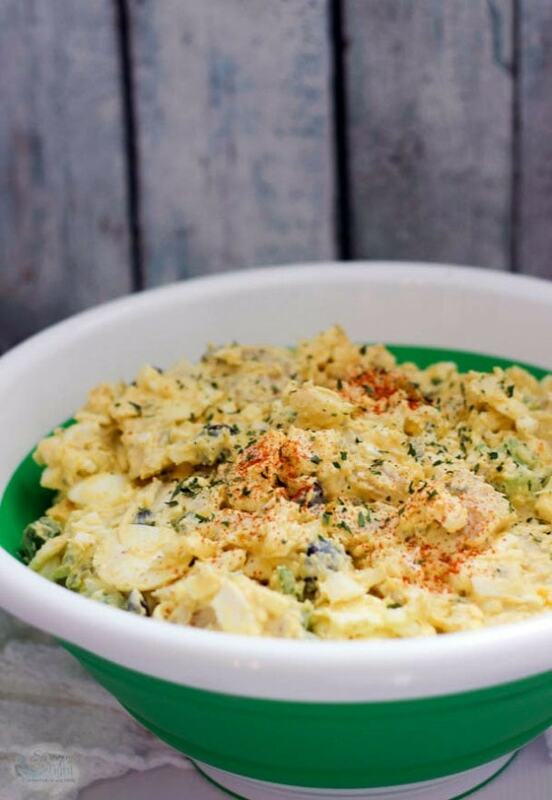 Although, this best potato salad recipe is so good you are going to want it more than one day! This lools tasty I ahve nfver ese cumber in there. And we use cealery sed. Nice. twist. I like adding the black olives. Most of the rest is very similar to one I make. 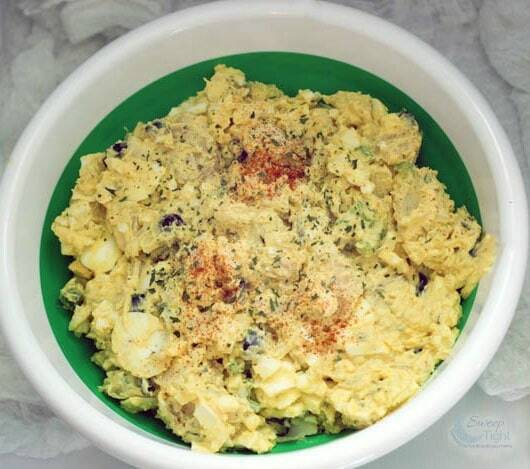 This potato salad looks delicious, I can’t wait to give it a try. Thank you for sharing this recipe. 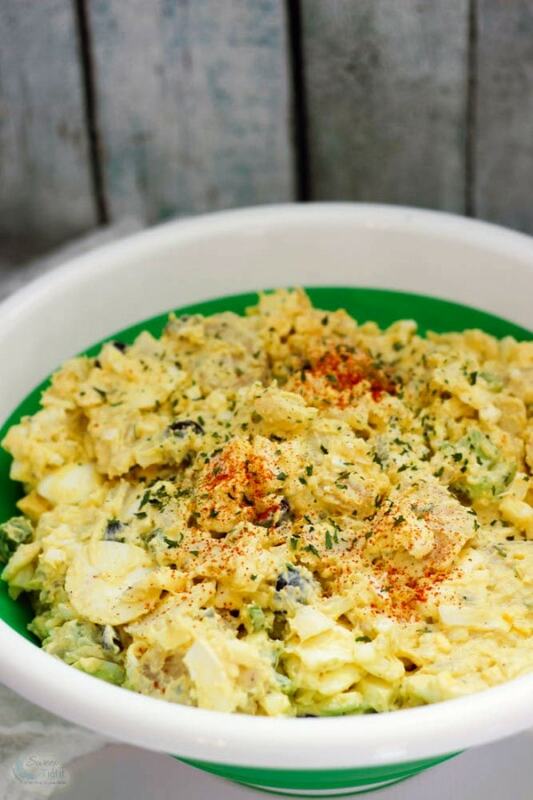 I love potato salad, a perfect time of year to make it too! Now I want some! I always like using red potatoes to make Potato Salad because it tastes so good with these potatoes! I want to make your recipe, it looks so delicious! Thanks for sharing. This looks really good. The base ingredients would also make for a great pasta dish, I think. But I would have to argue with you about it being the best. My mom makes the best potato salad, lol. Though, I think everyone thinks their mom makes the best anything, lol. This looks delish – I would definitely eat it every day! This looks so good, thanks for sharing!! Sounds so good! Thank you for sharing on Idea Box link party! This sounds so delicious! I love potato salad. It also looks easy to make. Thanks for sharing!